Annapolis Bermuda Ocean Racers Depart! At 1:30 p.m. at “R2” off Annapolis, the 27 competing boats in the 2018 Annapolis Bermuda Ocean Race (A2B) departed for their 753-nautical-mile offshore race. If you’d like to follow racers’ progress, find the A2B Race Tracker here. A2B is a more intimate race than the fabled Newport Bermuda Race, which commences just a week later and draws nearly 200 entrants from around the country and internationally. It’s that way by design. 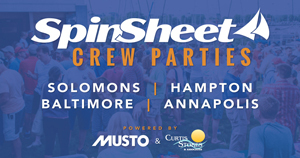 The fleet tends to hail from local ports in Maryland, DC, Virginia, and Pennsylvania, and the race committee seeks to provide an aspirational event that will enable sailors to fulfill a lifelong dream. Being responsive to the needs of each boat while promoting the art of navigation is the goal. Multiple pre-race seminars are offered, and mentorship from seasoned veterans helps new racers get their boats and crew prepared. PHRF and class divisions are designed to ensure a competitive experience for both veteran offshore racers and more casual cruisers. Although A2B is smaller by plan, the course is significantly longer. Those new to Bermuda racing may find this surprising, but A2B’s opening 125-mile Bay leg makes a big difference: A2B covers 753 miles; the Newport Bermuda course is 635 miles. The challenges posed by A2B are many, and the inshore leg really sets it apart. The long, opening inshore leg provides an opportunity to settle boat and crew and begin implementing the watch system, but it also brings added challenges: determining the favored side, maneuvering the shipping channel, reading those notoriously shifty summer Bay breezes, and keeping an eye out for pop-up thunderstorms. 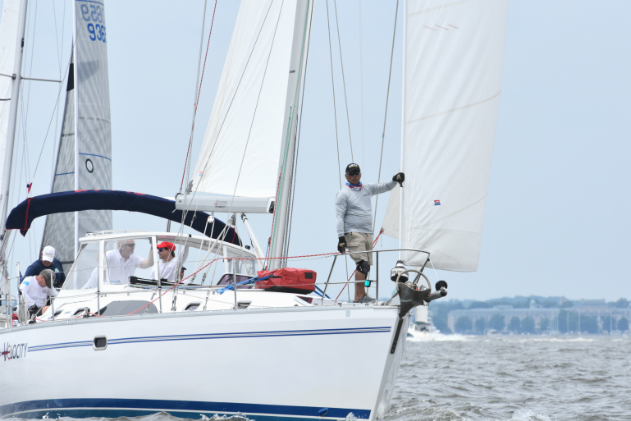 Many boats will have used the popular Down the Bay Race held Memorial Day Weekend to get some good Bay practice. This will be Joel Aronson’s third A2B, and his second on his Hylas 44 Atlantis. “Racing to Bermuda is a great accomplishment, and there are few places in reach that are as welcoming and pleasant. The biggest challenge will be getting down the Bay. While my favorite part of the race is finishing, exiting the Bay Bridge tunnel is second,” he says. Upon leaving the mouth of the Bay, Bermuda racers from Annapolis face ocean challenges similar to those racing from Newport, most notably crossing the Gulf Stream, but also weather, waves, and the possibility of seasickness. On the other hand, they can look forward to the adventure of a lifetime, amazing marine wildlife, and Dark ’N Stormies at the finish, where the Royal Hamilton Amateur Dinghy Club provides dockage and hospitality. The Annapolis Bermuda Ocean Race awards lots of silver at the prize-giving ceremonies. 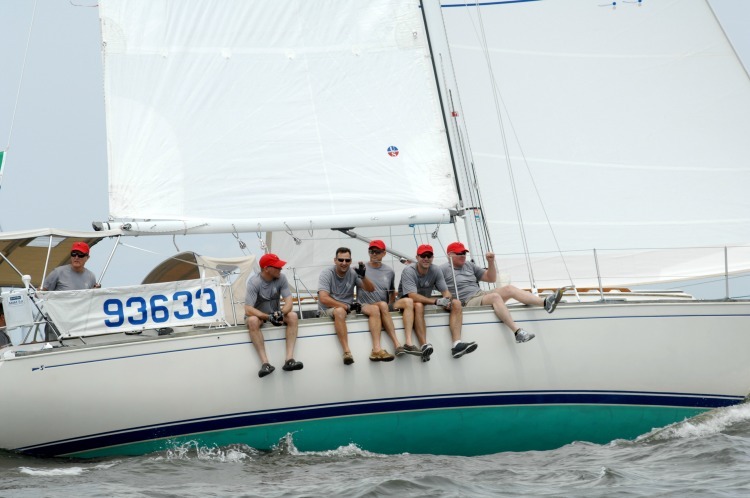 They include trophies for first to finish overall, fastest corrected time out of the Chesapeake, fastest corrected time for the ocean leg, as well as first, second, and third place finishes in each class. In addition, the Storm Trysail Club Trophy and the Weems and Plath Navigator’s Log Trophy are also available. The Storm Trysail Club Trophy is awarded to a club and to individual yachts. To qualify, at least two yachts must be skippered by members of the same club. The award is presented to the club whose top two racers achieve the best combined score. The Weems and Plath Navigator Trophy is awarded to the navigator whose logs and plotting sheets are found to be complete, neat, and readable. The judges will look for a navigator who exhibits conservative, knowledgeable, and conscientious navigation, incorporating proper dead reckoning, charting some celestial and some electronic navigation. This includes keeping a proper dead reckoning tract, the plotting of lines of position, and other phenomena in the proper and traditional manner. Find SpinSheet's A2B start photos here.